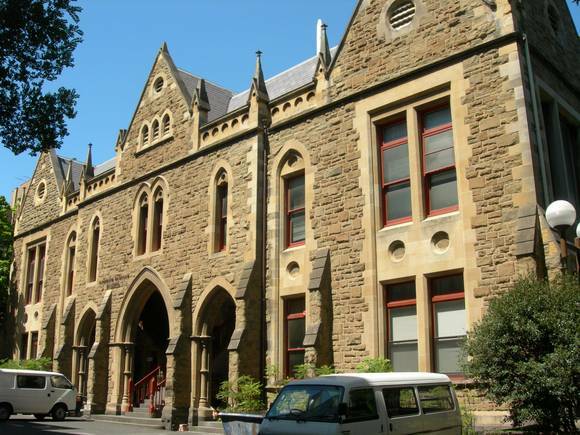 1. the building known as the Old Pathology Building, University of Melbourne, Parkville shown marked B-1 on Plan 600787G(A), endorsed by the Chairperson, Historic Buildings Council and held by the Director, Historic Buildings Council. The Old Pathology Building at the University of Melbourne, the south wing of which was originally constructed in 1885, was designed as the new medical school to accommodate the Department of Anatomy and Pathology. The University had established Australia?s first medical school in 1862, and the first Professor of Anatomy and Pathology was H B Allen, appointed in 1882. His collection of specimens for a museum of pathology was too large for the Melbourne Hospital and was transferred by deed of gift to the new Medical School. Allen was closely involved in the design process for the new building, designed by architects Reed, Smart and Tappin. The building was extended in 1900 to designs by Smart, Tappin and Peebles. The two storey building is in the Early English Gothic style, with emphasis on the lancet arch motif. The principle facades have bluestone plinths and are buttressed. The rusticated stone walls are contrasted by the smooth dressed stone of the window openings. The roof is steeply pitched and clad with slates. The north and west wings are constructed of brick with segmental and square headed windows with cream dressings. The south building still illustrates the original concept for the "new medical school", including the spacious Museum of Pathology complete with clerestory windows housing Allen?s collection until the 1960s. The two storey gallery space has been converted into two floors. However, the windows, ceiling area, vents and columns remain intact above the false ceiling. In the 1930s, Peter MacCallum, a successor to Allen, established the Society of Pathology and Experimental Science. As a result five new research laboratories were added in the 1950s. The north wing, with a first floor added in 1908, was designed to accommodate a dissecting room, associated coffin and preparation rooms, and anatomy lecture theatre. Whilst the partitioning has been substantially modified, some original fittings and spaces remain to demonstrate the former layout of the wing. The Old Pathology Building is of historical and architectural significance to the State of Victoria. The Old Pathology building is historically significant as an expansion of the first medical school in Australia. It was significant for the importance it placed on rigorous medical training during the late nineteenth century, when disease was reaching epidemic proportions. The building's close association with H B Allen is reflected in the design, to which he contributed, and in the remaining elements of his Museum of Pathology which housed a collection of specimens recording the range of contemporary illnesses and diseases facing the nineteenth century medical profession. In his position as Pathologist to the Melbourne Hospital, Allen was instrumental in establishing clinical pathology teaching at public hospitals, and fostered the establishment of the Walter and Eliza Hall Institute for research in pathology and medicine. The Old Pathology building is architecturally significant as a fine example of early English Gothic architecture, characterised by the use of lancet arches and attached buttresses. The choice of collegiate Gothic demonstrates University Council?s resolution that all buildings be built in a consistent style. The later additions, including research laboratories, demonstrate the expansion of the university?s important research role in the 1950s.